While everyone else is cozied up inside, why not take the opportunity to get outdoors? The autumn crowds have cleared, which means for the most part you won’t have to call to book your campsite ahead of time. 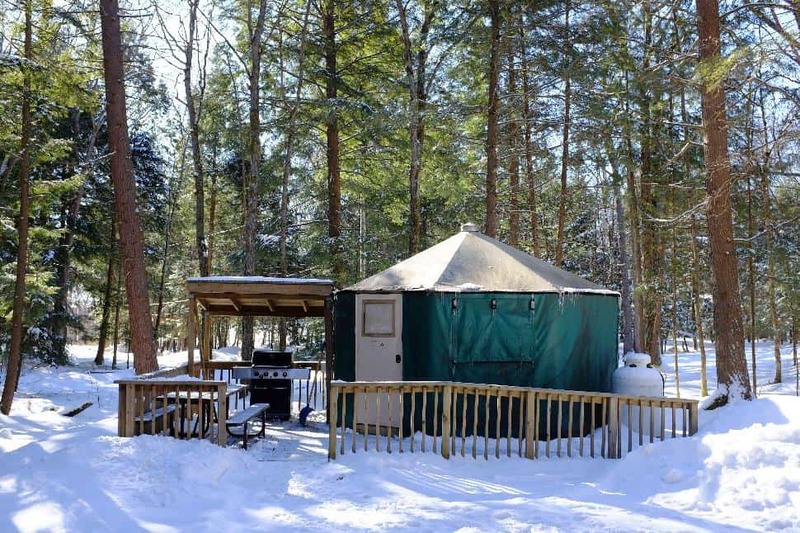 Sleep outside in a tent, trailer, cabin or yurt for an overnight adventure in Ontario's winter wonderland. 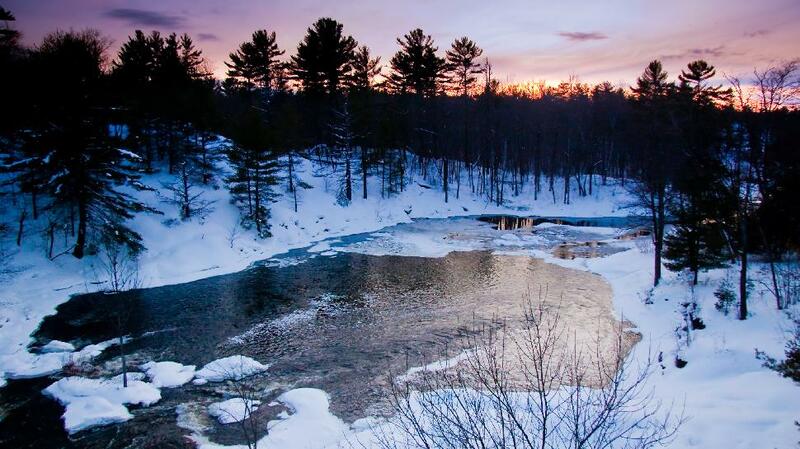 Now, let’s get to the winter camping in Ontario Parks! The Pinery is a top summer destination for Ontarians, but did you know that it can be just as fun in the winter? Located on the south shore of Lake Huron, you can catch a glassed-over view of the water when you visit in the cold season. Don't miss the 38 kilometres of looped cross-country skiing trails. Located near Port Elgin, here you’ll find the bluest waters in Ontario (thanks to the Georgian Bay). Combine that turquoise blue water with some white snow and you’ve got the most picturesque winter wonderland. The park is known for its 400-metre skating trail that's lit up at night. 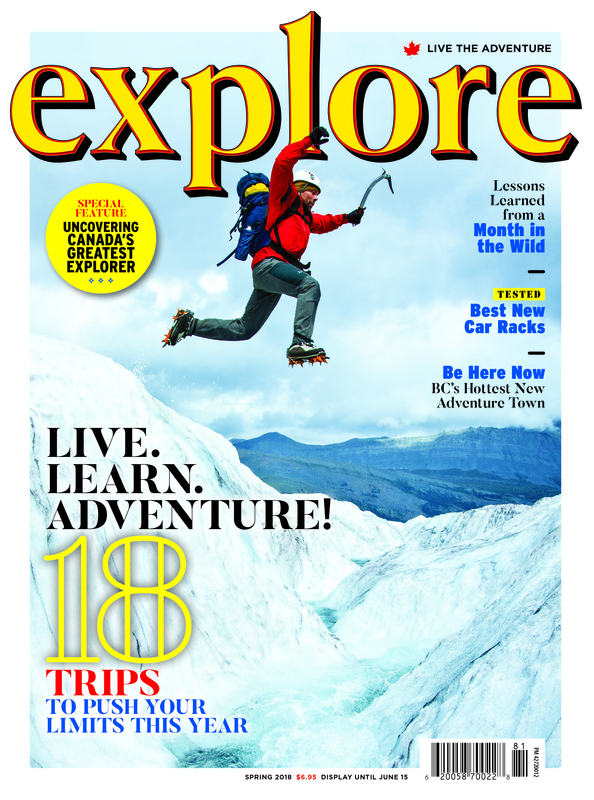 You can also explore 11 kilometres of ski trails or trek through the areas on snowshoes. At the end of the day, you can cozy up in one of the 16 yurts or your own tent or trailer. This area is surrounded by water, so can be on the cooler side. Algonquin is world-famous for a reason. Admire the lush forest's frosted tips in winter. The Mew Lake Campground is open year-round. Sites are available on a first-come, first-serve basis. 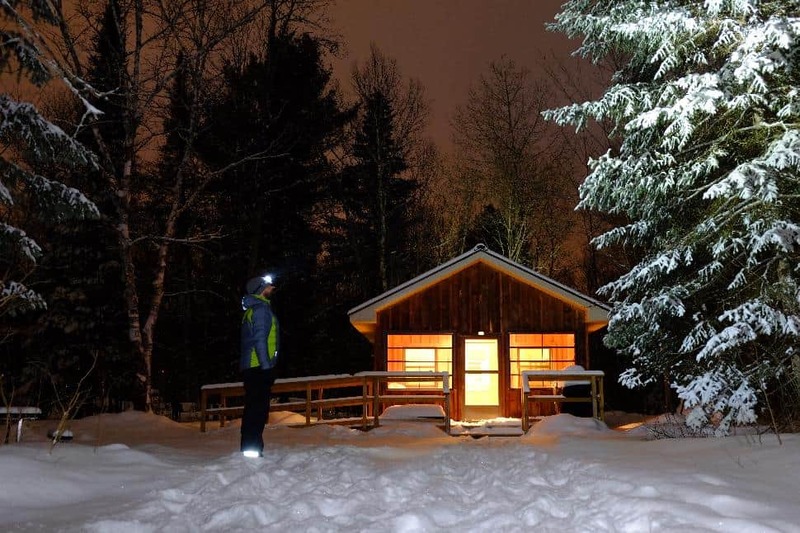 The park also has seven yurts open for those needing a retreat from the crisp northern air that’ll catch you after a day of 70+ kilometres of cross-country skiing. Go full Canadian and pick up some hockey sticks on the nearby skating rink – it wouldn’t be a winter experience without our favourite sport. Silent Lake makes winter camping look easy. With ploughed areas, you’ll have your tent set up in no time – which means more time for ice fishing on the lake! Comfort Stations are available in each campground that include flush toilets, vending machines, showers and laundry facilities. With all of your needs taken care of, you’ll have plenty of time to explore the ski trails or snowshoe trail down Bonnie’s Pond. If you really want to relax, stay in one of the yurts that features a woodstove. Now that’s cozy. Kawartha is the second largest park in southern Ontario after Algonquin, but it's not as well-known. When Algonquin is packed, Kawartha is a quick drive away to get the isolated experience with nature that you need. With all of the forested areas, picking your campsite wisely is essential. 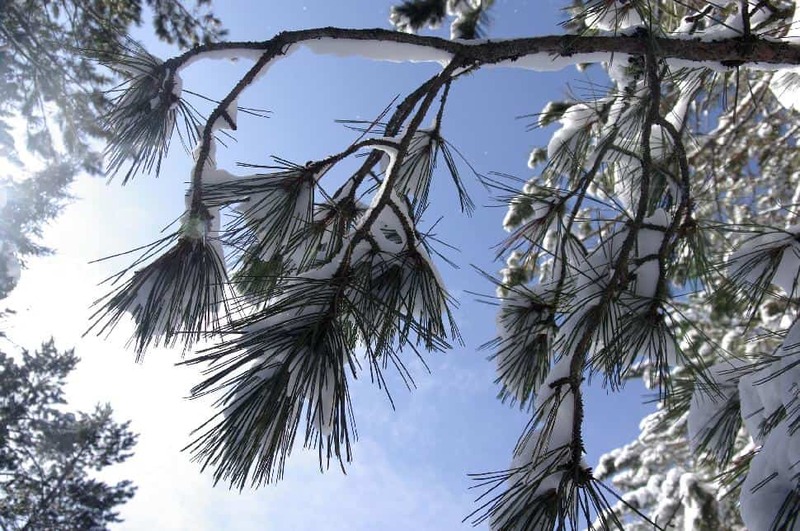 Pick a low-sheltered area away from snow-laden branches. Backcountry campers are required to set up tents at least 30 metres away from any designated campsite, shoreline, trail or portage. Obtain a permit online first through Ontario Parks. Escape the busy Toronto lifestyle and head north for the winter. This camping experience isn’t for the faint of heart, or for any of you glampers—this is one of the only areas that doesn’t offer a yurt or cabin to escape from the cold. Brave the real winter camping experience and get out of your comfort zone. Frontenac has 22 frozen lakes that give it a unique winter shimmer. Cross-country ski along 11 kilometres of track-set trails, when conditions allow. The park has information boards located throughout the trails to guide you and to add a little educational component to your adventure. Pack your camera and take off for the Dawson Trail Campground. These nature trails are worth an Instagram shot. Once you have your picture, quietly take in all of the silent surrounding nature. This park is known for its ice fishing and polished ski trails for experts and novices alike. With over 100 campsites and 2,000 backcountry sites, you don’t have to worry about booking beforehand. There are also heated yurts and log cabins for all you home-bodies. Winter park fees can be paid at the Information Pavilion. Backcountry campers need a permit from the Ranger Station. You’ve got your gear and your family, now hit the road and experience northern Ontario like you never have before. Brave campers have access to over 40 backcountry lots, each with a fire pit, to keep you warm after a day spent on the 50 kilometres of groomed cross-country skiing trails. You may want to splurge on one of the six cabins available with washrooms, linens, heating and three bedrooms. Whatever gets you out onto the trails overlooking Lake Superior—you don’t want to miss them. Teetering on the border with Manitoba and far from the warm front, you can imagine that this is true winter camping. Woodland only offers backcountry camping and the undisturbed boreal forest is home to one of the largest groups of woodland caribou south of Hudson Bay. If you wanted to get away from the noise of the city and enjoy some much-needed solitude, this is the place for you. The area is home to local First Nations peoples who offer stories and teaching throughout the park. If you notice any rock paintings, they must be treated with respect. Remote wilderness meets backcountry camping for a traditional winter camping feel. This park has a deep cultural history with the Indigenous communities, and you can definitely feel the peace when camping here. The park is located near Thunder Bay and is known for its legendary fishing for both walleye and northern pike. If you get too spooked to stay in the cold, you can fly into lodges and resorts nearby. Otherwise, it’s wildlife viewing and ice fishing in the great outdoors. Arrowhead is a Muskoka dream—especially come winter time. What is a busy national park in the warmer season actually lightens up come winter (but truth be told, it’s way more beautiful with snow). There’s a secret fairy-like forest skating trail and plenty of skiing opportunities to stay busy. After a long winter adventure, head back to one of the camp cabins equipped with propane/electric fire, kitchenettes, tables, chairs, gas BBQ and picnic table. Head 50 kilomotres northwest of Sudbury to find some of the best snowshoeing and cross-country skiing in the region. You don’t have to be an expert; these trails are groomed for even beginner skiers. Lounge in the ski chalet or stay overnight one of the four fully-equipped yurts. You can afford to be spontaneous with the seven walk-in sites for backcountry camping, or make it a party with the two large group sites with fire pits, bathrooms, picnic shelter, water tap and barbecue. Explore the iconic provincial park located right off of Highway 637 in Killarney. It’s a little more deserted during the cool season, and the park office and comfort station are closed, so you’ll need to walk 500 metres to your campsite. But don’t worry, there are gear sleds available, as well as washrooms with hot water and flush toilets. The park is great for those looking for a snowshoe or relaxed cross-country ski weekend down the scenic trails. You haven’t experienced true peace until you’ve looped through open fields and mature pine forest. 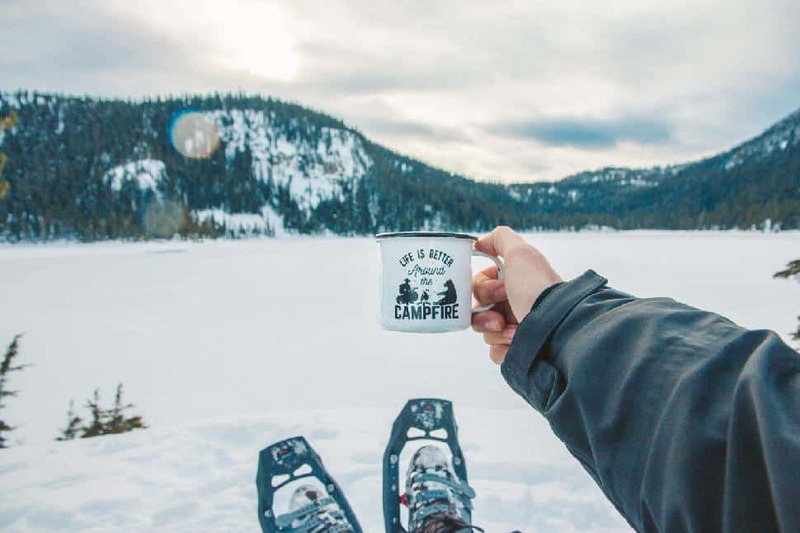 Have you been winter camping? PS. 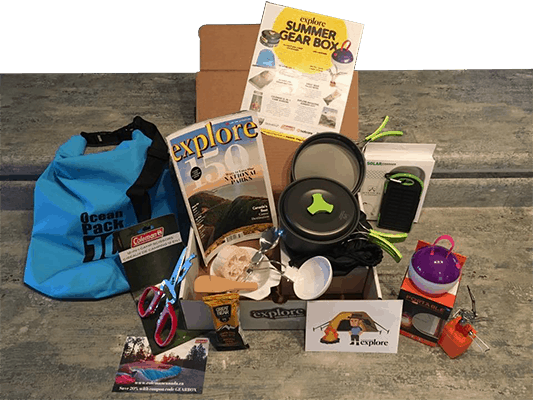 Do you want to be equipped for more adventures?